A year before the Fisher Body Craftsman's Guild (FBCG) launched in 1930, a Detroit News newspaper article covering the burgeoning "Industrial Art" arena quoted Mr. Earl's positive vision on educating future generations of American car builders, "It is indeed a queer thing," said Mr. Earl "that while the motor industry is one of the most powerful in the country, no important course are being given in the schools in automobile design. Such a course should depend upon the closest cooperation between the students and the automobile industry." And the 1967 NYTimes article, directly below, clearly demonstrates how this new industrial arts movement became a national yearly phenomenon. "Aimed at youths," this art & engineering program was an inspirational beacon of light. 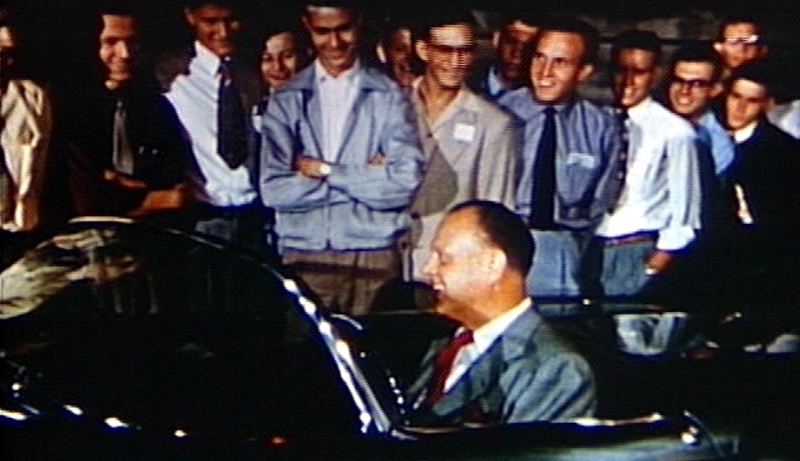 FBCG boys on tour of GM Styling with HJE in 1951. 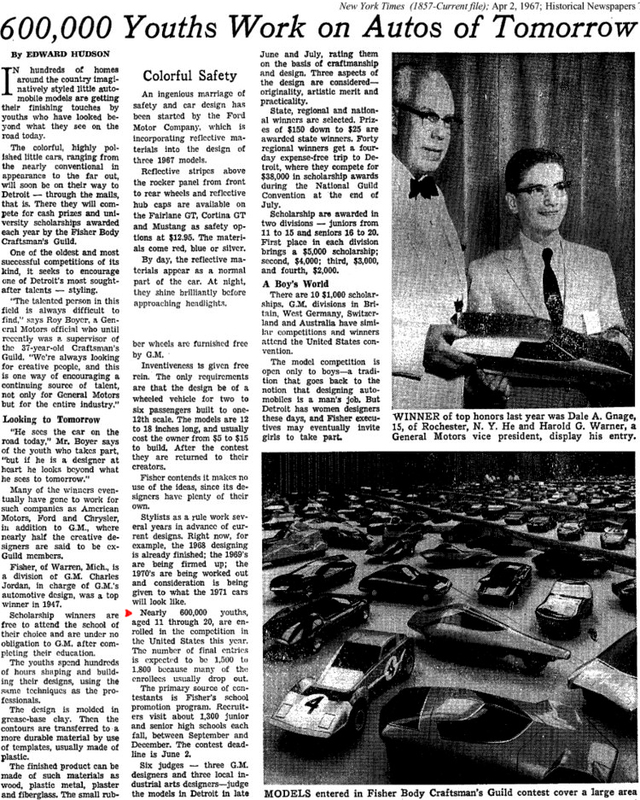 The miracle of the mid 20th century industrialized art world is directly linked to Mr. Earl's becoming America's Car Design Pioneer, and, the FBCG and the Detroit Institute of Styling (both geared to develop highly paid auto stylists, i.e., car designers, see below) were offshoots of this new business calling. Harley taught General Motors how to get its "modern" game on by creating the first car design department (where "determination of policy" was at stake) that was elevated high up inside the corporation's hierarchy. The new area was key to unlocking a much more sophisticated universe of auto making. Pieces of GM's historical portrait, like what's featured here at this link, still play an enormous role behind the company's ongoing success. Regardless of the 08/09 bankruptcy period, GM still remains America's largest auto maker for over 85-years in a row along with being a huge volume production success story for today's giant automotive economy. 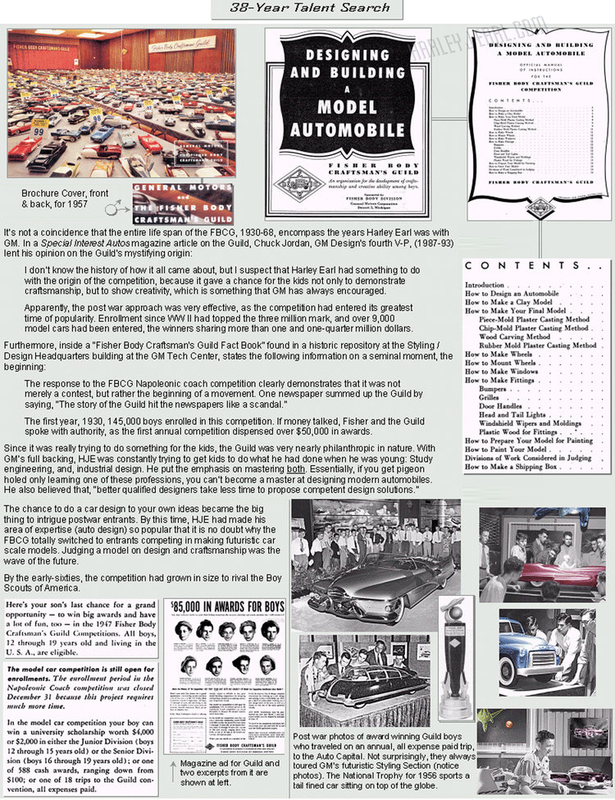 Historical picture, above, by GM Photographic demonstrates Harley Earl's 3D DNA world best. As a matter of fact, every global car maker today follows this exact technological business pattern (pre-engineering a car or truck ahead of time) in full-size clay model mode within a state-of-the-art car design department. The operating system of Car Design is afar from "low tech" and just look at GM's state-of-the-art design studios, pic directly above, from 1964. What you see in this picture is "exactly" what every car company in the world today is still using to birth all their major car and truck designs. The technology has held the test of time and computers are still way behind and/or no where near superseding this advanced building template and/or methodology. Before coming to GM, H.J. Earl had already perfected using all new tools (some of which are seen in the above photo) and had created an entirely new hybrid engineering language. Furthermore, the entire "glossary of terms" still used by all car designers, around the world today, is built on top of the ones HJE originally created long ago. Why did Harley's invention of creating this formalized business pattern entail such an incredible forward vision, hence becoming such a titanic achievement today? Because since the end of WW Two, every car and truck -- worldwide -- comes to life using this pioneer's advanced car design technology. Yes, it's truly an astounding figure, 1 billion cars and trucks stem from the original clay modeling process the California engineer Harley Earl invented. Type in "full size clay models of cars" into your search engine and you'll see that every major auto maker in the world today still follows Harley Earl's advanced pattern of building modern automobiles. This technology has played the most significant role of turning the automobile into a more artful product. GM's first Car/Auto Design department allowed remarkable changes to go on and take place inside this company.